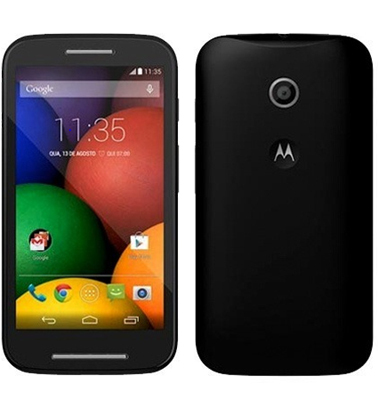 The Motorola Moto E (2nd Generation) measures 5.11 x 2.63 x 0.48 inches and weighs 5.11 ounces. The device is available in black or white and features a band around the edge which covers SIM and memory card slots. Capture the moment quickly by activating the 5 megapixel camera with just a twist of the wrist. Take great selfies and photo with cameras on the front and back to share with friends. The device features Panorama, 4x digital zoom, Auto HDR and Quick Capture. There is also a front facing VGA camera. The 4.5 inch qHD crisp display has a resolution of 540 x 960 with a pixel density of 245ppi. Corning Gorilla Glass and a water resistant coating help protect your phone and keep it looking new. An all-day 2390 mAh battery lets you go further and longer without stopping to recharge. With a fast quad-core processor and Android 5.0, Lollipop, the device has 1GB of RAM, 8GB of internal memory with a microSD expansion slot up to 32GB. The device features 4G LTE connectivity and Bluetooth 4.1.